Instead of performing on Wednesday, the cast rehearsed new safety measures agreed with state officials. After Thursday's hitch-free return, lead actor Reeve Carney said the show was "always safe" but was "now safer". 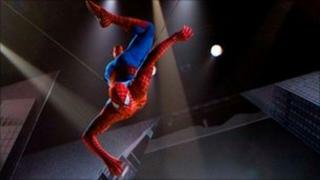 Spider-Man double Christopher Tierney, who fell 30 feet on Monday, is due out of hospital this weekend. Despite wearing a safety harness, video of the incident showed him falling from a ledge into a stage pit. According to his brother, Tierney was in "good spirits" and was expected to make a full recovery. New precautions for Spider-Man: Turn Off the Dark, which features nearly 40 aerial stunts, require a second person must check harnesses after they have been put on. A representative of the stage employees union IATSE said it was "confident in the additional safety protocols". On Thursday, producers Michael Cohl and Jenny Harris took to the stage at the start of the show to explain they had ironed out problems. "If you weren't nervous tonight, you'd have to be an idiot," Cohl said after the performance. Director and co-writer Julie Taymor said the cast and crew had got together before the show "and talked about Chris". "Chris gave us the spirit tonight," she added, revealing that only one stunt had been cut from the production. The $65m (£42m) show features music written by Bono and The Edge of Irish rock band U2. Following a number of incidents during preview performances, it will now have its official opening night on 7 February.